With all the places you take your vehicle, there’s a lot of potential to unintentionally stain your interior with mud, grime, and spills. Any number of things can be to blame: wet or snowy weather, dust from a day of hiking, a child’s creativity with crayons. That’s where floor mats comes in, designed perfectly to fit your Acura TSX. By protecting your interior, you also protect your vehicle’s resale value. Permanent stains will drag down the value of your Acura, so floor mats are important to protect your investment. Floor mats are easy to remove and clean on their own. The carpeted OEM replacement mats are available in multiple shades and you can trust that a genuine Acura TSX floor mat will match the color of your interior. The optional Acura OEM rubber all weather mats are the perfect upgrade for protecting the vehicles interior from damage to the carpet. 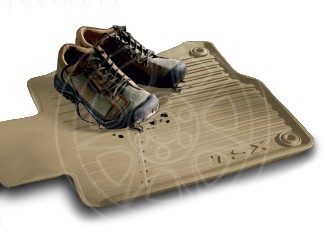 The grooves of the all weather rubber mats are especially helpful in catching dirt, snow, mud and beach sand from your shoes before it can spread. Easy to clean…just remove, hose down, let dry and put back in. As simple as that. OEM Acura parts are designed to fit the specifications of your vehicle, meaning you can enjoy a tight-fitted mat that won’t shift while you drive. When a floor mat doesn’t match the dimension of your vehicle, it can curl up and interfere with your pedals, causing danger on the road. Rest easy with a genuine OEM match. 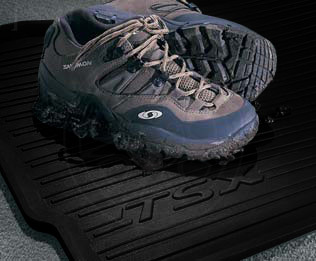 Made with durable rubber or carpet, our Acura TSX floor mats are made to last. 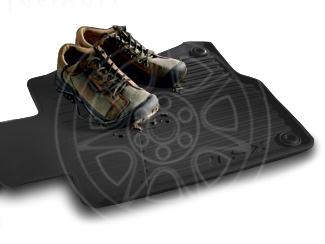 Through rainy days and muddy shoes, you can trust that an OEM mat will not easily tear or break. However it can happen, and if you notice damage to your floor mat it is important to replace it before spilled liquids and grime can seep through the cracks.